KICKER and SSV Works deliver great tunes on the trail. 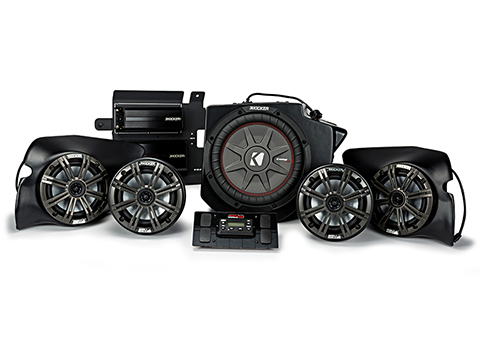 This complete plug-and-play, five-speaker system is custom made for your RZR, right down to the wiring. To get tunes to your system, an SSV Works receiver is included, delivering AM/FM and Bluetooth connectivity to two KICKER PX-Series powersports amplifiers. These weatherproof amps give you 800 watts worth of juice for plenty of volume on the trail. For mids and highs, a set of KICKER KM-Series weather-proof speakers are mounted in a pair of custom SSV Works kick-panel enclosures. The enclosures are mounted high in the kick panel, allowing plenty of leg room during the ride. Another set of cage-mounted SSV Works speaker pods with KM speakers are mounted above the rear seats for additional volume and sound quality. SSV Works’ unique glove-box sub enclosure is armed with a forceful KICKER 10-inch CompRT subwoofer. Made to be completely hidden yet incredibly loud, the enclosure replaces the factory glove box. You get tons of bass, and keep your storage space! © Copyright 2002 - , Dragonfly Cycle Concepts - All Rights Reserved. Website Design, Hosting and Maintenance by New Tech Web, Inc.